Mercenaries perform one of the most dangerous and feared jobs in the world. Their task is to go into remote locations and remove their targets by any means necessary. They are hired hands, and have no remorse for their actions. 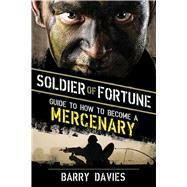 Along with Soldier of Fortune magazine, Barry Davies teaches you the training and knowledge that goes into being a mercenary. Davies will also go into the history of the profession and show how it has evolved. It's always been about the money, but in this book, you will learn all the skills that you must acquire before you take your first job. You will learn: Where and how to find work How to understand and apply the most modern tactics What languages to master Which weapons are preferred How to disappear after you've completed your job Mercenaries are usually trained as part of the best Special Forces, including American Delta Force, British SAS, French Foreign Legion, Marines, SBS, SEALs, and many others. This guide will teach you everything you've ever needed to know about becoming a mercenary, and also how to excel at it with information on weapons, escape plans, and overall safety. Remember, Article 47 of the Geneva Convention states that a mercenary shall not have the right to be a combatant or a prisoner of war. Getting caught is not an option, and in this manual, you will learn how to avoid that at all costs.